A workspace consists of boards. In Infinity, you can add as many boards to your workspace as you need. You can use boards any way you like. 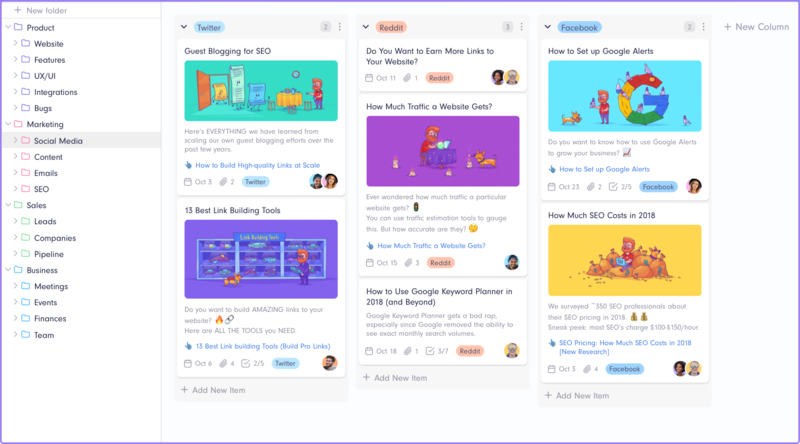 For example, if you’re organizing the whole company inside one workspace, your boards can be different departments you want to organize: Marketing, Accounting, Production, HR, etc. After you’ve gone through the sign-up process, you will already have the first board created and you will be able to build your workspace from there. You can easily create a new board directly on the dashboard. First, you should give your board a name by typing it in the top field. 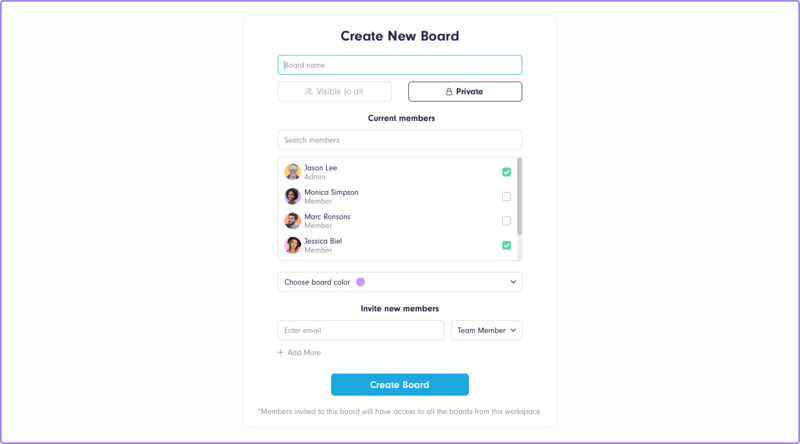 Choose whether your board will be Visible to team (in which case, all invited members will be able to see and contribute to the board) or Private (in which case, you will need to choose which members will be able to see and contribute to the board). You will be able to see the current members of the board and invite new ones to join. Invite new members by adding their email addresses and choosing the role they’re going to take (workspace member, board member or admin). Once you’re done, click Create Board and that’s it. Congrats! You’ve created a new board. Now, let’s see what happens inside. 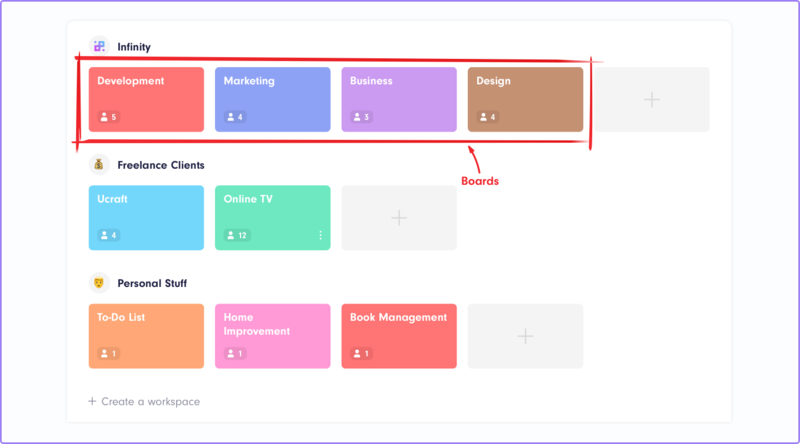 As we already said, you can use a board to store and organize everything related to one company department or one client, if you’re a freelancer. Or, if you’re using it for personal plans, each board can be dedicated to one aspect of your life you want to organize, e.g. diet, workout, studying, etc. Once you’ve created a new board, you will first get a set of templates to choose from. You will get to choose among several options that will help you quickly get a ready-made board that fits the purpose you intended. The template you choose will shape the look of your board. 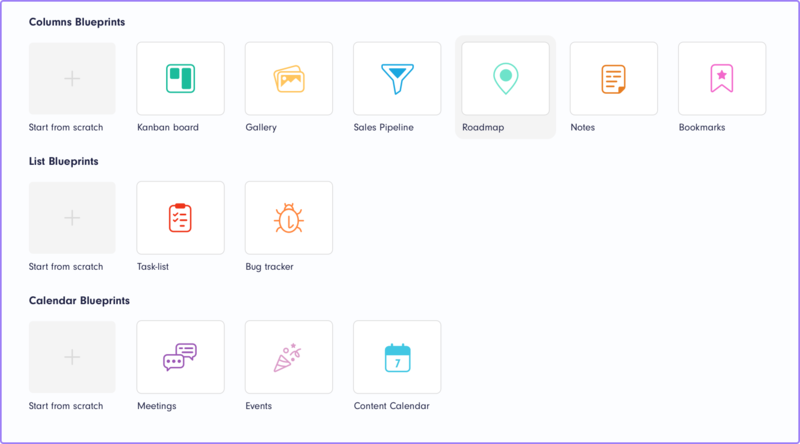 You will get a predefined view, a set of attributes and demo data to help you get started. Of course, templates are only meant to help you create the board you need more easily, but you can always change and customize the template as you see fit. You can also build your board from scratch if that’s how you prefer it. A board will basically be the hub of all the information, files and processes related to that board. It ultimately consists of items that you can categorize in different folders and manipulate in many different ways. In the board header, you will find several useful buttons for manipulating and navigating your board. Let’s start from left to right. In the top left corner, you will find the Boards button. 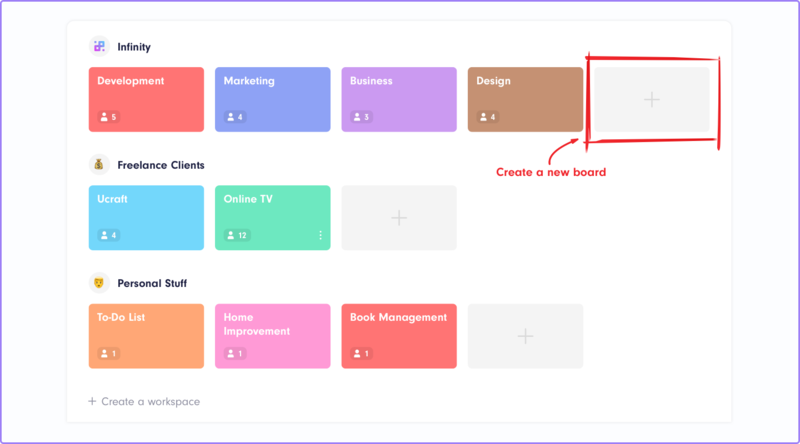 Clicking this button will give you a list of all the boards in all the workspaces you have, so you can easily switch to another board without having to return to the dashboard. Next to it, there is the Theme Color button. This button will give you the options to change the theme color of your board. In the top right corner, you will notice the Invite button. This button will allow you to invite new members to this board directly from the board. 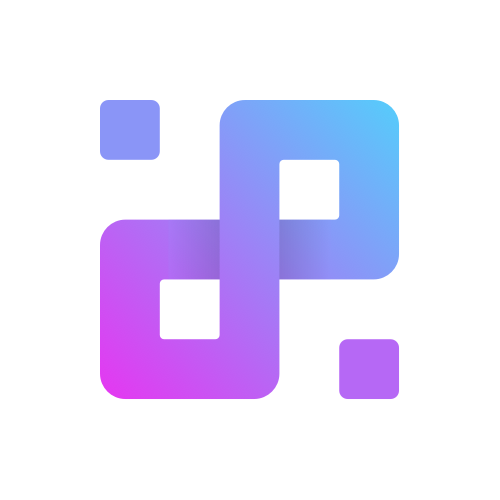 Moving on, there is the Share button that will give you the option to share Infinity with friends and family and earn Infinity credits for each new person you bring. On the far right, you will see your profile photo. Clicking it will open the options to change settings about your account (like your photo, password, email, etc.). You will also be able to switch to another workspace or create a new one if you have permission to do so. And you will be able to log out. And if you want to leave the board and go back to your dashboard, just click the Infinity logo in the center of the board header. 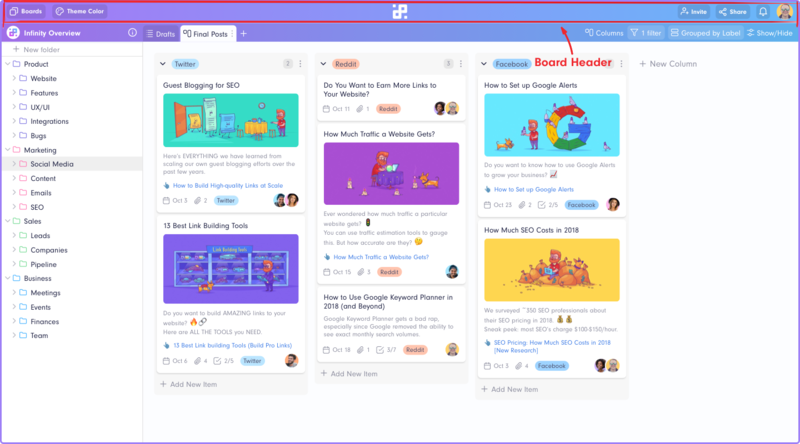 To delete your board, return to your dashboard, find the board you want to delete and click the three dots symbol in the bottom right corner. You will get the options to Rename, Change color and Delete board.